Since a few days, My Plex Media Server, hosted on my Synology, was not able to match movies anymore. And when matching movies manually, it was sometimes downloading the covers but never the metadata. Deleting the Service plugin solved the problem. I read that IPV6 could be the cause of such a problem, and that turning it off on the Synloloy was the solution. I tried that but without success. Log in my NAS as an administrator, in a SSH console, via Putty and enter root mode. 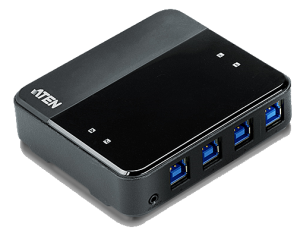 I recently discovered GateOne, a free HTML5 web-based terminal emulator and SSH client for which there is a Package for Synology on the SynoCommunity. Unfortunately, the setup doesn't work anymore on the most recent DSM versions. As SynoCommunity prevents users to manually download their SPK, I did recover it from Synology's temp download in order to fix myself the issues reported here and recreate a package. [EDIT 30/12/2018] I have posted a new version of this script here. 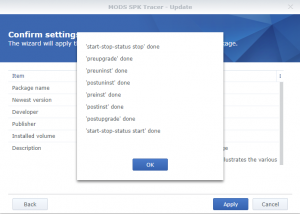 So, as one cannot manually download the Synology package (SPK file), the idea is to simply capture the SPK during its installation (even if that installation fails). First, log into a SSH console via putty and enter root mode. Voilà, first step accomplished. Now, look into your capture (Ex. : in \\<Your NAS>\web\SynoCapture\). You should see a folder named "@synopkg\@download\<Package>". This folder contains the package but without its file extension .spk (Ex. : @SYNOPKG_DOWNLOAD_<Package>). Gotcha !!! You should also see a folder named "pkginstall". This one contains the package deflated. Now, a little extra... you should also find a folder name "pkglist.tmp" containing two files: synoserver.enu and : otherserver.enu (with possibly other extensions depending on your DSM language?). 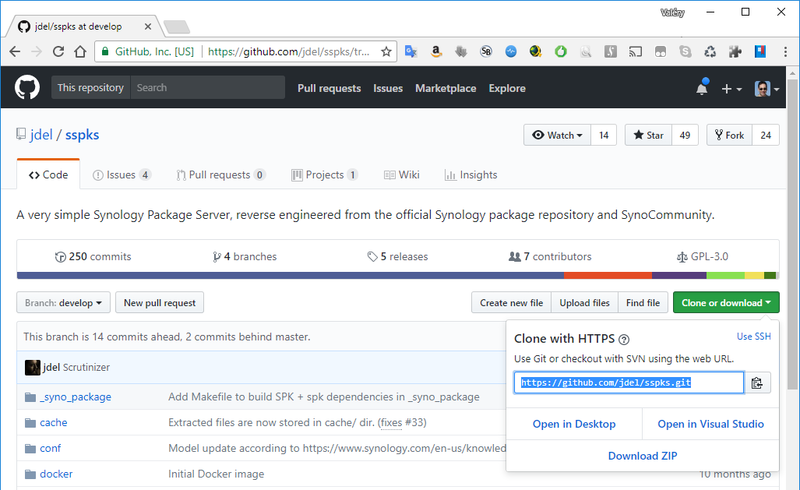 Those files contains the URL's of all SPK available respectively on the official Synology website and on the various SPK servers that you configured in your Package Center > Settings > Package Sources. You can copy/paste the content of output.txt into MyJDownloader (asking for a "deep link analysis"!). Magic ! 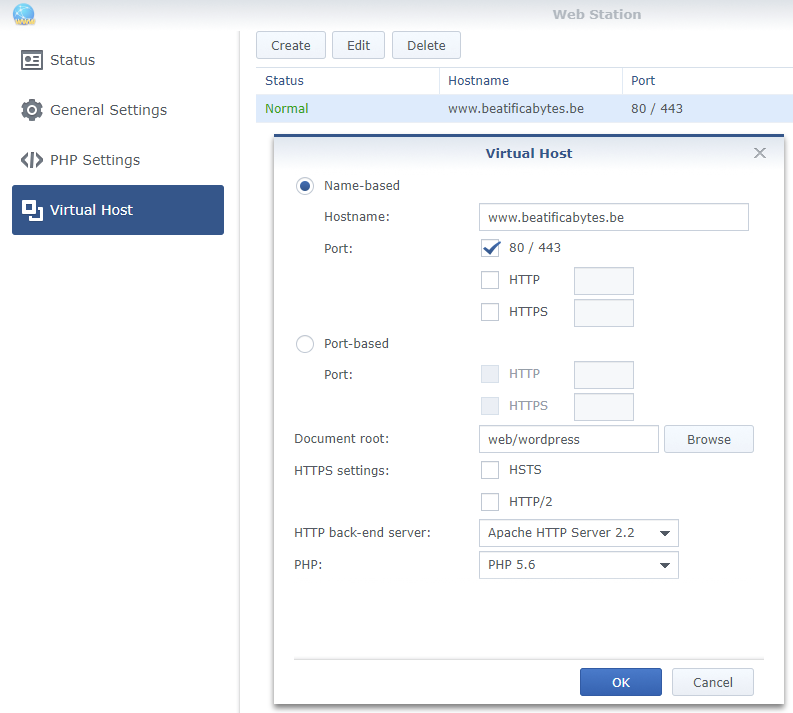 I did reconfigure my Synology Web Stations to access my blog directly at www.beatificabytes.be instead of www.beatificabytes.be/wordpress/. The problem was to redirect next the old pages still referenced by google onto their new address. Ex. : www.beatificabytes.be/wordpress/softwares onto www.beatificabytes.be/softwares. Using a RewriteRule did the trick. Finally, I did remove "/wordpress" from all URL's in my own posts. I didn't use a Search & Replace plugin like the "Better Search and Replace" to do the update directly in the database. Instead, I did use the plugin "Broken Link Checker" to Bulk Edit broken URLs. Finally, I had to redirect all old pages still referenced on Google to their new location. The obvious solution was to use a RewriteRule to be added in the .htaccess file used by WordPress (In my case, in /var/services/web/wordpress/.htaccess). Unfortunately, it took me hours to find the trick as, instead of reading the whole apache's RewriteEngine documentation, I tried to figure out myself how to do it, based on samples found on the web. Match any path starting with "wordpress/" and followed by "anything else"
Replace it with the part matching "anything else"
And if a match was found, do a R(edirect) and this was the L(ast) rule to apply (i.e. : stop). I didn't change anything else. 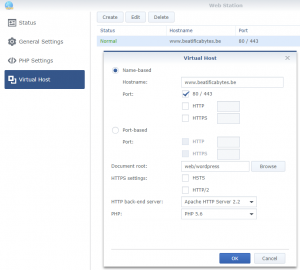 Also, changes in the .htaccess are taken into account immediately, without the need to restart the WebStation. I had troubles to use variables in various scripts or to create wizards via shell scripts. So I have created a dummy package logging useful information in a file to understand what's going on during the installation, the upgrade and the uninstallation of a Synology Package. Once installed, upgraded or removed (and obviously reinstalled), you can access its log file either by clicking on its icon in DSM's Main Menu, or by via the Package Center. While testing those wizard scripts, I have discovered that, at runtime, only the running script is stored in the temporary folder. The other ones are not available. No way therefore to call another script from the running one. Finally, the wizard scripts also logs the environment variables exported for them by the DSM. Not a lot are available during the execution of the wizard because the SPK is actually not yet expanded. The package comes next with the standard installation scripts, calling all a generic script that log the environment variables exported for them by the DSM. So, you can see in which script you have access to which variable. The scripts preinst, postinst, preuninst, postuninst, preupgrade and postupgrade have access to the same variables. But it's not the case for the start-stop-status script. Those scripts are also displaying info during the installation/upgrade/uninstallation process for the user. 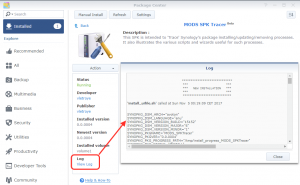 For that purpose, they write in the standard log file $SYNOPKG_TEMP_LOGFILE. Obviously the wizard scripts can't use this trick to display information to the user. But they don't need that as they actually display real screens (rendition of their JSON). Notice: often, variables accessible for a script must be persisted in a file to be retrieved later by another script. Ex. : the postinst script can store a variable received from the install_uifile wizard in a file so it can be read by the postupgrade or postuninst script later. Notice: the log file is only available in the Package Center if its path is returned by the start-stop-status script. Notice: the INFO file of this Package is quite standard. Also, during an upgrade, the script to stop, preuninst and postuninst are the versions of the previous package, not the versions of the new package !!! (Obviously). There is a really excellent project named SSPKS available here to host your own SPK Server on your NAS. Git, to be installed as explained here. Composer, to be installed as explained here. Now, open a SSH Console using Putty, log in as an administrator and enter the root mode. remote: Counting objects: 1443, done. Receiving objects: 100% (1443/1443), 1.31 MiB | 705.00 KiB/s, done. Resolving deltas: 100% (717/717), done. Failed to download mustache/mustache from dist: The zip extension and unzip command are both missing, skipping. Failed to download symfony/yaml from dist: The zip extension and unzip command are both missing, skipping. Next, move the complete stuff to your web site and link it with a folder 'package' where you will store your spk files. 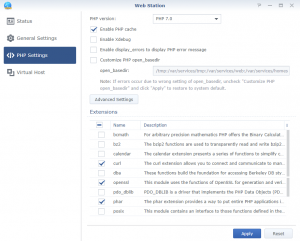 Here, I am using a folder in the web repository. 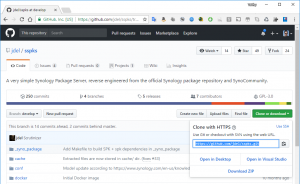 Here is how to install Composer on a Synology, required among other to install various php applications available on GitHub, like the "Simple SPK Server". 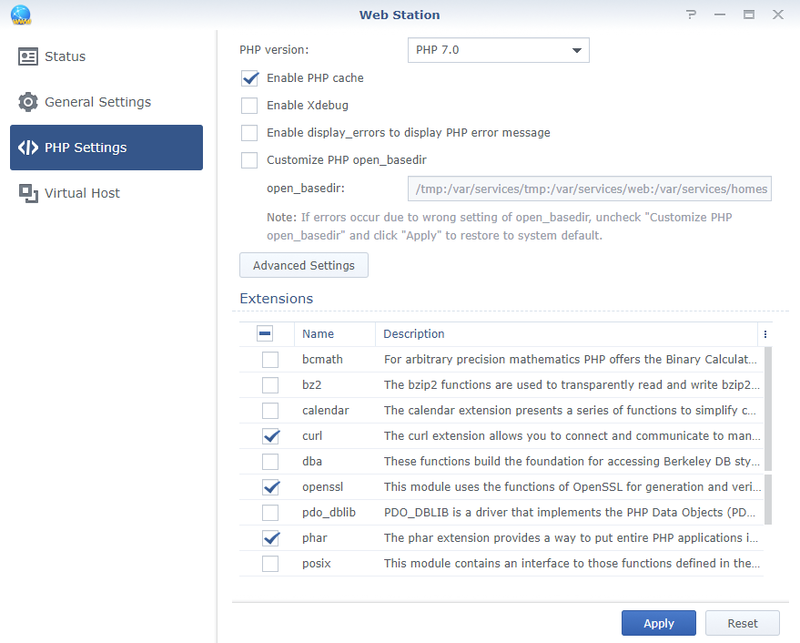 Connect into your DSM, open the Web Station via the Main Menu and enter the PHP Settings. There, select first the "PHP version" = "PHP 5.6", tick the Extensions: curl, openssl and phar, and click Apply. Next, do the same for the "PHP version" = "PHP 7.0". Now, open a SSH Console via Putty, log in as an administrator and enter next the root mode. Enter the modification mode by typing the letter "i". Press 'Esc' to quit the modification mode. To write the changes and quit vi, type next ":wq" (without the quotes). 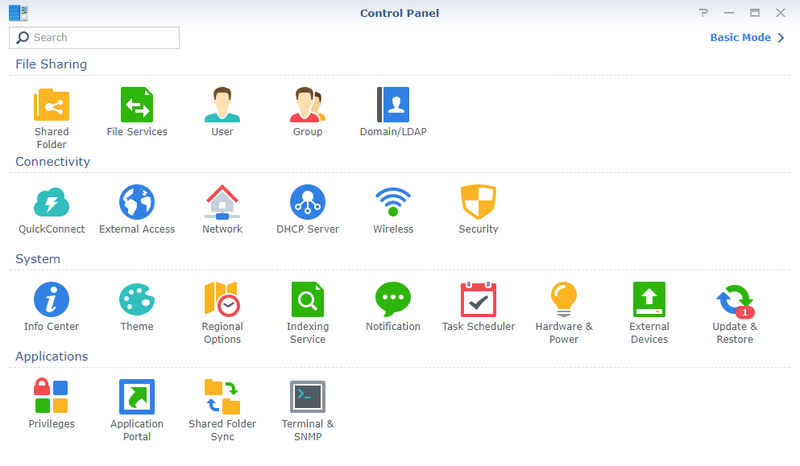 Log as admin into your Synology via the DSM web interface. 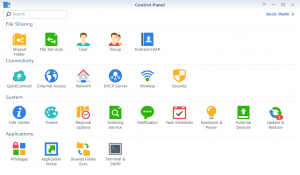 If you don't know its URL anymore, run the Synology Assistant on your PC (The setup can be found for your model on Synology's download page) to find your NAS. Right-click on it to connect. Notice that for illustration purpose, my NAS is named here "Hades" and has 192.168.0.200 as local IP. Once logged in DSM, open the Control Panel. If you see only three lines of icons (titled File Sharing, Connectivity and System), then click on the blue link "Advanced Mode" in the top-right corner. You should see a dark "console" icon named Terminal & SNMP in a fourth section named Applications. Click on that icon and in the tab Terminal appearing now, tick the option Enable SSH service. Configure the Port number that your want to use, E.g. 22, 5022, or any port still free. 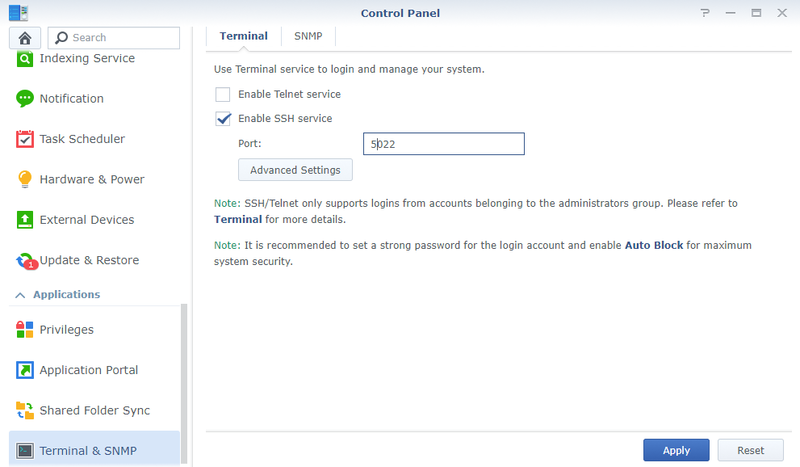 Notice the message: only account in the administrators group will be able to log in SSH console. On the opposite, you won't be able to log in with the root account. Also, as recommended, go next into the Security section of the Control Panel and enter the Account tab to tick the option Enable auto block. E.g. : you can block there any IP address which failed 3 times to log in during the last 15'. 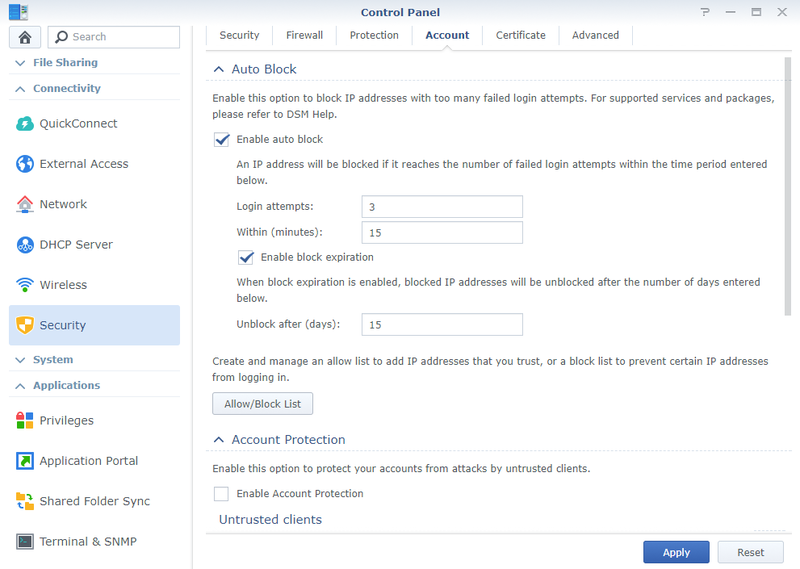 You can also tick the option Enable block expiration to unblock such IP after e.g. 15 days. 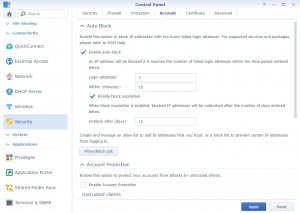 Notice: this "auto block" feature has been very useful for me when I started to use a VPN on my NAS to access internet. Many IP, mainly from Russia and China, have been blocked. PS. : SSH is recommended over Telnet, as using encrypted communications. But if you really want, you can also enable it. Download Putty from here and install it on your PC. It's an open source SSH and telnet client. Run Putty and enter an administrator account in the Auto-login username of the category Connection > Data (as illustrated bellow in the right screenshot, I am user the user named "administrator" created previously and member of the User Group "Administrators"). Next enter your Host Name (or IP address) and Port in the Category Session (as illustrated bellow in the left screenshot). Check that the selected Connection Type is SSH.Finally, select the Default Settings entry and click on the Save button next to it. This is important to keep your setting for the next time you will run Putty. Now, click on the Open button and the bottom-right. 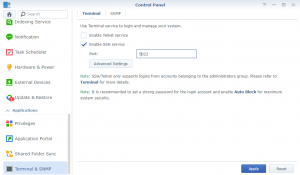 This will start the SSH session with the preconfigured account "administrator" . You just have to type his password. Notice: on the first use, Putty will display a warning message about the encryption. You have to accept it. PS. : You can similarly open a Telnet session if you did enable it. You will be prompted for a password. Type again the password of the administrator account. 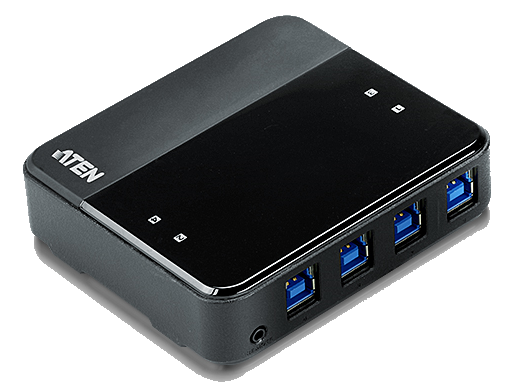 Voilà, you are now connected on your NAS as a root. PS. : Here is the official Synology documentation to log on your NAS via SSH or Telnet.